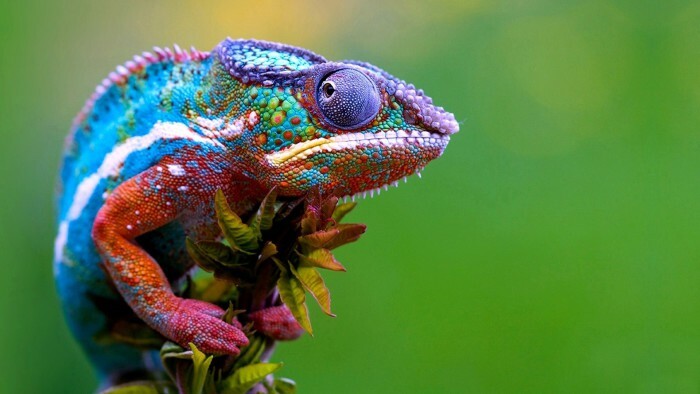 Contrary to popular thought, chameleons do not change colors or patterns to blend with their surroundings. Rather, their color change is primarily for intraspecific communication. Most calm, content chameleons display a base color of green, often with other marks to break up their outline. When a chameleon wants to change colors, he redistributes the pigment in the chromatophores — small structures located in the skin. When the pigment in these chromatophores moves, a variety of colors show through. Chameleons also thermoregulate by changing colors. They turn darker when they need to warm up and paler when they need to cool off. Body language and posture changes are often the first element of communication for chameleons. If a chameleon wants to guard his territory from a trespasser or repeal an overzealous male, he will usually turn to the side as a first move. This allows the chameleon to look as big as possible and effect the most impactful visual display. A severely stressed chameleon may gape, bite or hiss at a conspecific or at a predator. Some chameleons are especially noted for such behavior; it is more prevalent among large species like the veiled chameleon (Chamaeleo calyptratus), who may hiss and gape when approached by his handler. Chameleons are largely solitary animals, except when they are mating. While some males will allow unreceptive females to live in their territory, others will exclude all animals except receptive or recently bred females. In almost all cases, males will exclude other males from their territories. The first step of a territorial interaction is usually to display the brightest territorial color display possible. Panther chameleon males are some of the most interesting species, as the males are not only incredibly colored, but they present colors that vary with geographic location. Males from Nose Be and Ambanja present lots of blue tones, whereas males from Tamatave often display bright red colors. Some species, like the Jackson’s chameleon (Chamaeleo jacksonii), rely less on bold colors and instead use their facial horns to battle for territory and resources. When a female and male encounter each other, the female will adopt receptive or nonreceptive coloration, indicating her reproductive state. Though the color change varies by species, most receptive females display colors at the light end of the spectrum, relative to the species. When a female chameleon is not receptive to mating, she will adopt dark ground colors, sometimes offset by bright markings. Hissing, gaping and other negative body language usually accompany the color change. In most cases, the communicated message is clear, and the male will look elsewhere for breeding partners or wait until the female’s color changes to receptive. Gravid female chameleons are often colored in a more exaggerated form of the nonreceptive coloration. Mating can be very stressful for female chameleons, and if one is already carrying fertilized eggs, she needs to avoid stressful encounters and injury. Chameleons often adopt dark or sharply contrasting patterns when attacked by a predator, as well, presumably to communicate that the lizard is dangerous or distasteful prey.